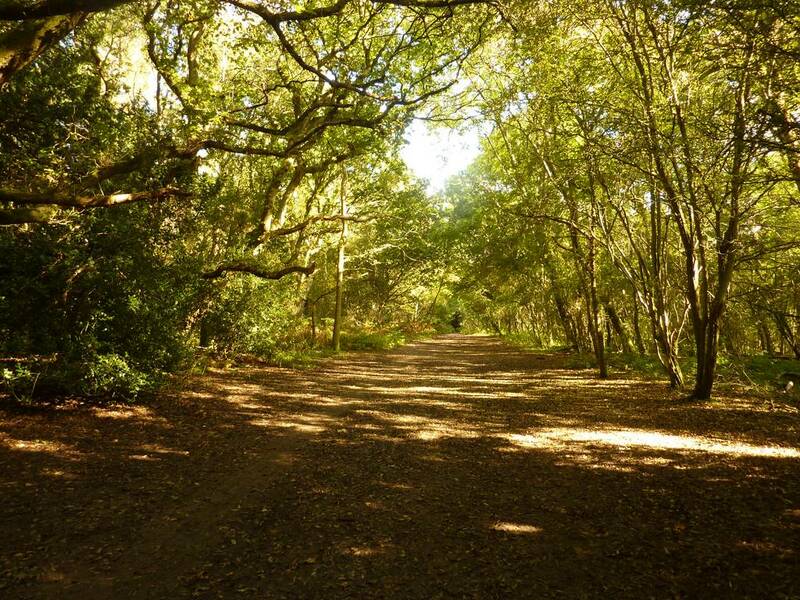 Autumn is often regarded as a dull and depressing season, with falling leaves, dying plants and short, rainy days. But it’s also a season of colours, gorgeous harvests, and nature preparing itself for a few months’ sleep! 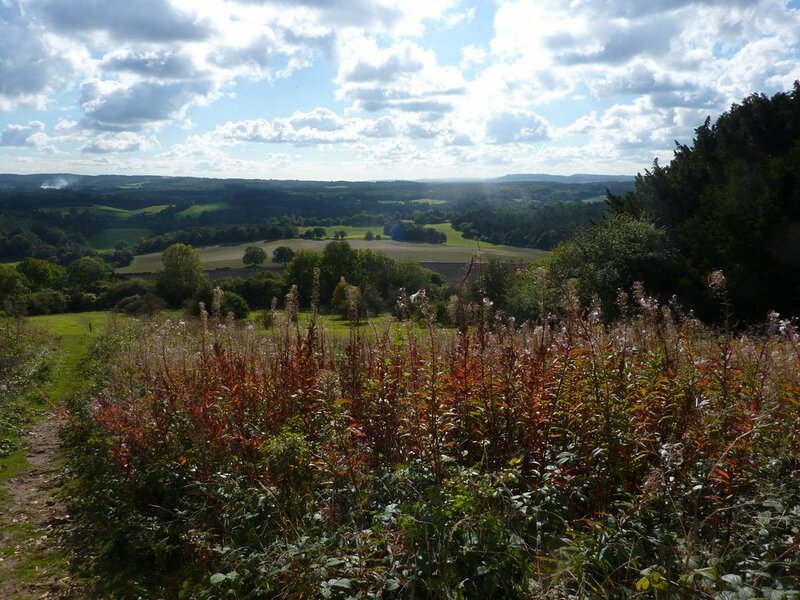 In October obviously, the landscape looks a bit different…but certainly not less interesting. In the foreground, the Rosebay Willowherb (Epilobium angustifolium) is now displaying its feathery fruits and brightly coloured leaves. Berries stand out among the yellowy foliages. They all look very tempting, but not all are edible, and some are in fact quite poisonous! Let’s start with the blue and purple ones…an easy one to begin with, the blackberry (Rubus fruticosus). 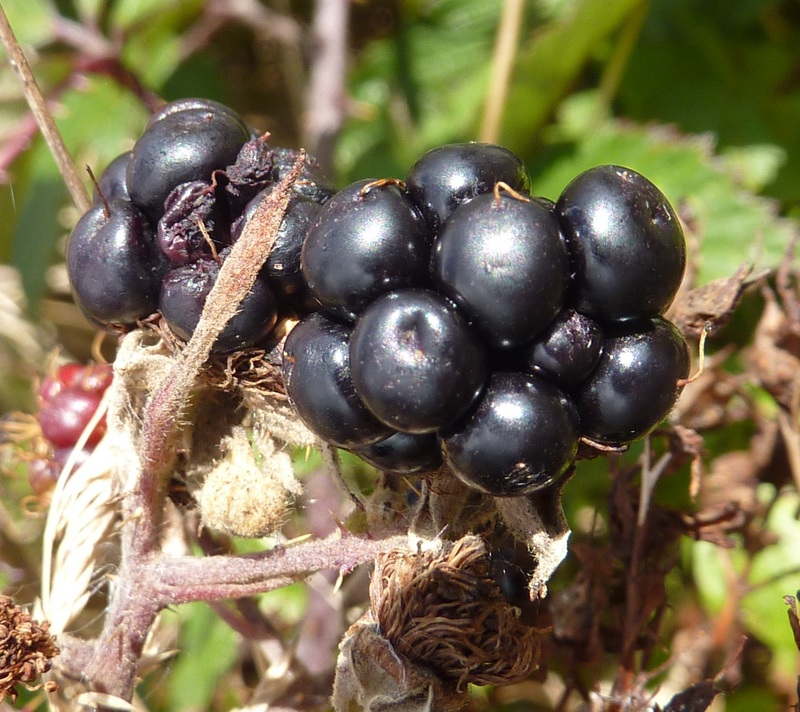 Despite growing on the nasty and prickly brambles, it is a very interesting fruit, with various medicinal properties. Like all dark coloured fruits (and like wine, or chocolate! ), the blackberry contains pigments which have a powerful antioxidant effect. Number 2 is slightly trickier. It is a conifer, as you can see the needle-like leaves, but it does not have the typical cone-shaped fruit! This small inconspicuous “berry” gives a strong, resinous smell when crushed, and is used to produce a well-loved drink. No clue? 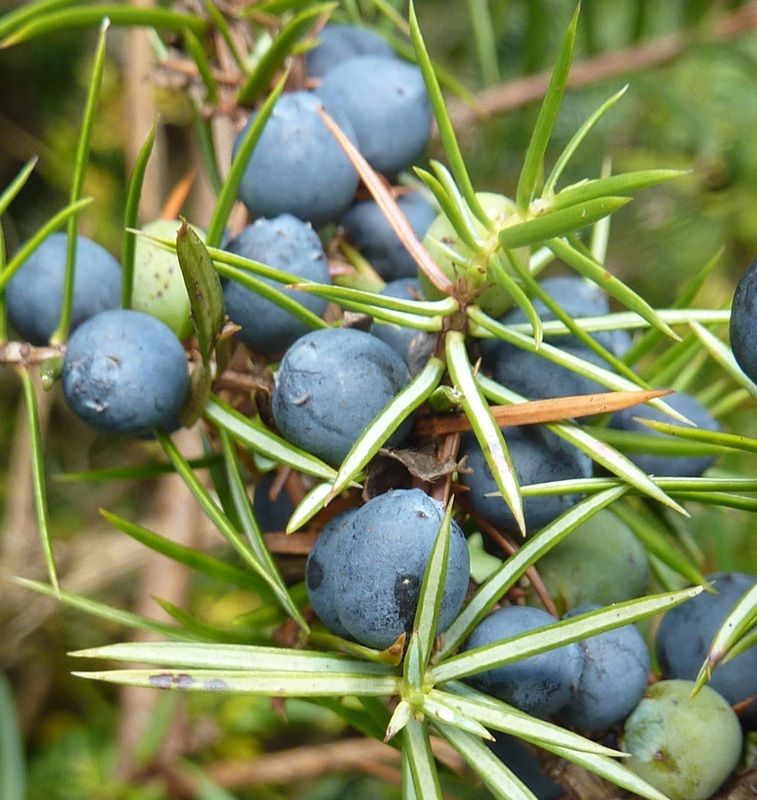 This is the Juniper berry (Juniper communis), which gives us…gin! It can be dried and used to flavour meat dishes, and it’s actually the only conifer product that can be used as a spice. Moving on to small trees, I cannot miss the sloe berries, which are looking fabulous at the moment. Sloe (Prunus spinosa) seem so popular in the UK (in France on the contrary, just a few people in the North East use it to produce spirit). This spiny shrub is native to Europe, and has been heavily planted as hedges, which makes it widely available. It has a tangy taste that gives marvelous jams, preserves, and of course, the famous sloe gin. 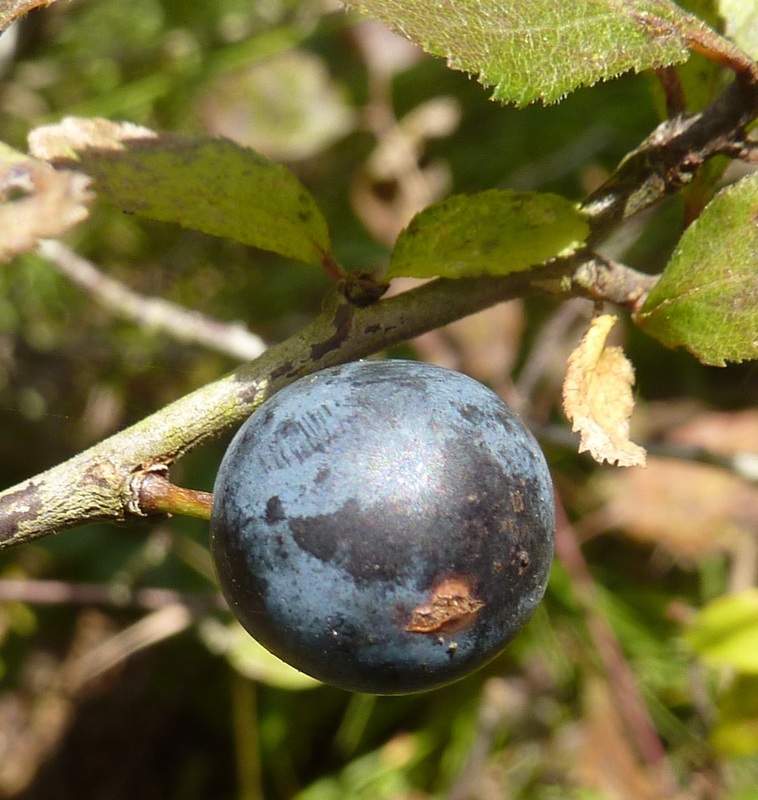 Like all plums, sloe berries have pruinosity (a white powdery substance on the skin) that makes them easy to recognize. You might encounter similar looking berries, which do not have pruinosity. The ripe berries should be a bit darker, and more clustered than sloe. 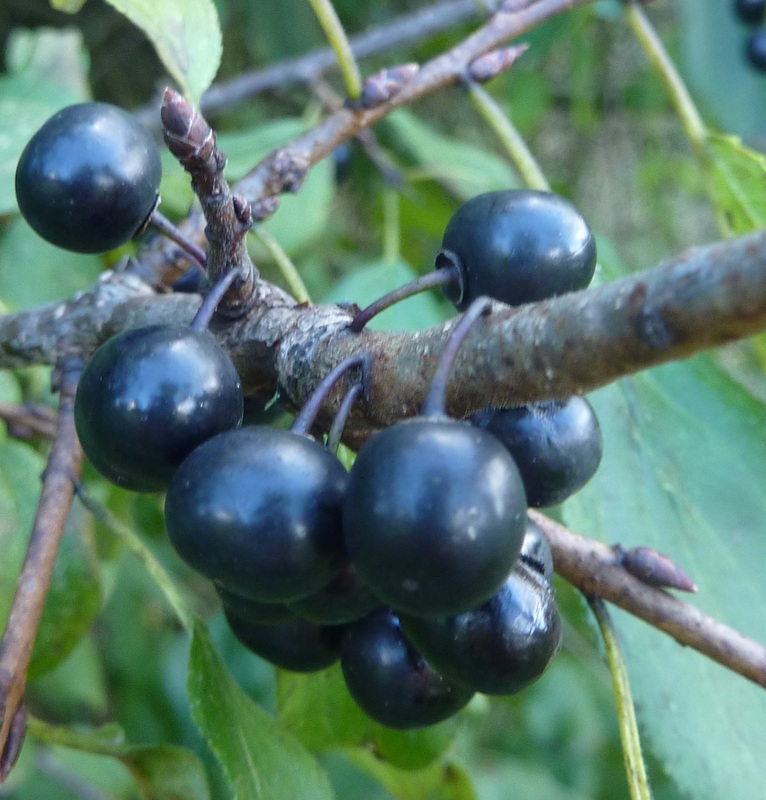 This is the common buckthorn (Rhamnus cathartica), whose mildly poisonous fruits were once used as purgative. Eating them won’t kill you, but you might regret it! Red and pink fruits also draw attention in the autumnal landscape. 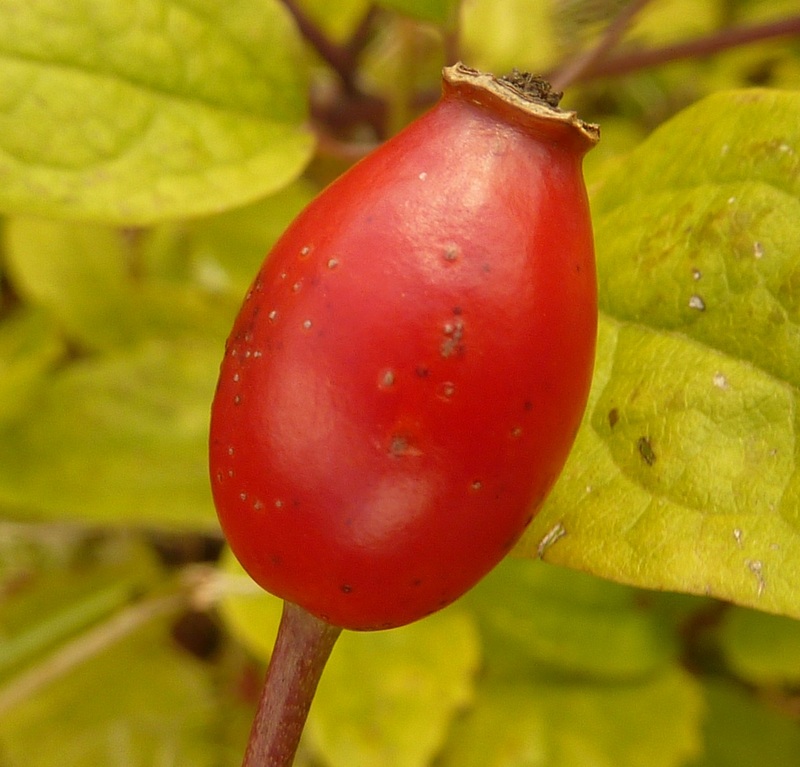 The Dog Rose (Rosa canina) fruits, called rose hips are classically used by children for pranks as they give itching powder (but they are also edible, rich in vitamin C, and produce delicious jams!). 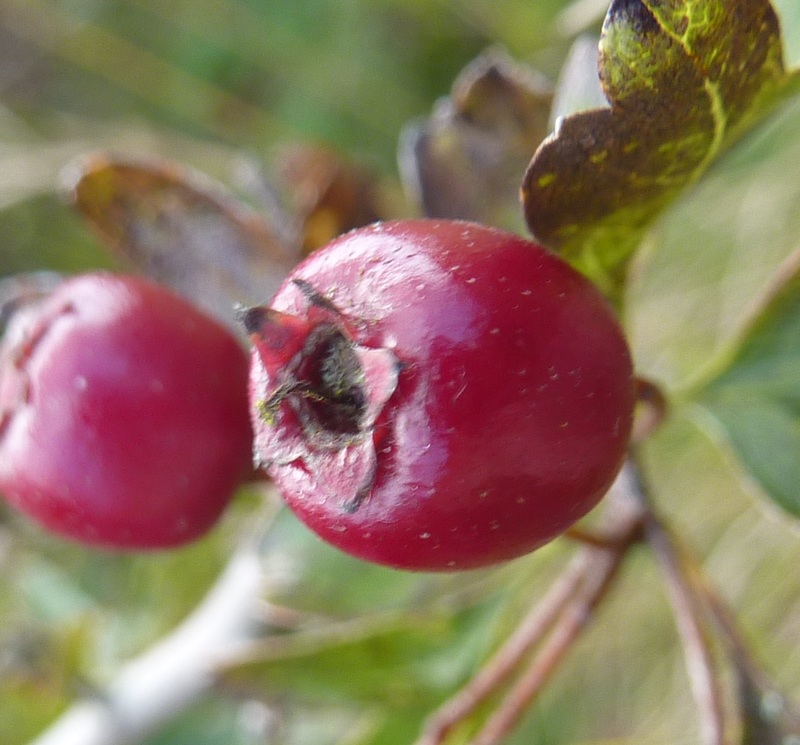 Belonging to the same family, the Hawthorn (Crataegus monogyna) gives small, apple-like fruits called haws. All parts of the plant are edible, the fruits are also used to make jams, syrups and wines. Some very attractive fruits are also very poisonous! 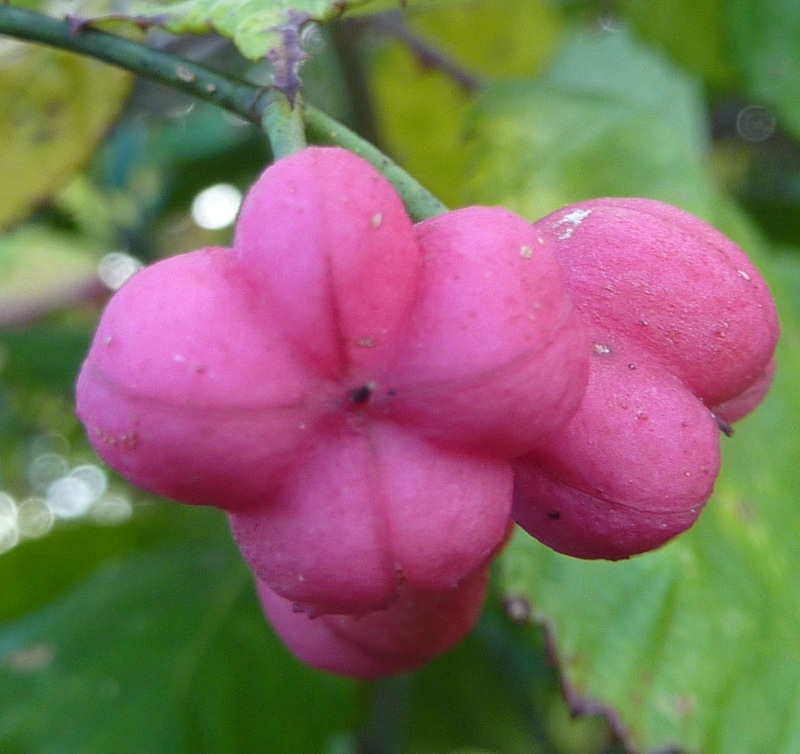 This is the case for the European Spindle (Euonymus europaeus), a small tree which has decorative pink four-lobed fruits very appealing to young children. It contains alkaloids which can cause serious heart-related symptoms. 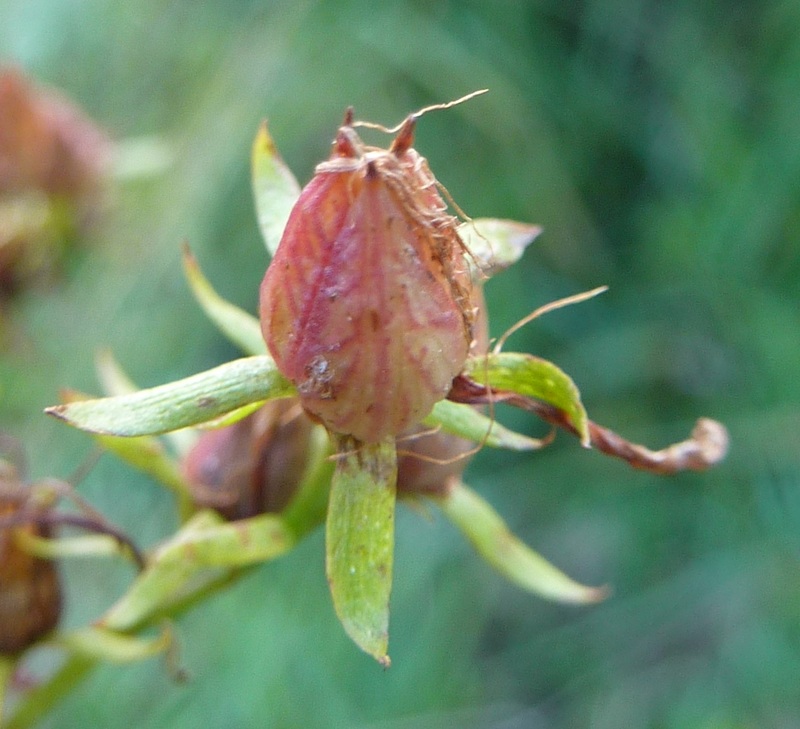 On the other hand, St John’s Wort (Hypericum perforatum) is poisonous to cattle, but not to humans! This little herb, which bears yellow flowers around St John’s day (24 June) is one of the most powerful natural treatment available against depression. There are many more fruits and berries available in the wild, some are delicious but poorly known, and worthy of being discovered…..but as with fungi, ask first if you’re not sure of what you’ve found! Very useful to know! Sloe gin does seem popular lately. When I was a lad, I was always told that you should never eat blackberries after Michaelmas (24 Sept) as the Devil had peed on them. I can think of no reason why late season blackberries should be any different from summer blackberries and I’ve often wondered about how that “rule” came about. I enjoyed the information. I was a little confused as to which picture was attached to which description, but eventually figured it out. Keep up the good work! And thank you for being out there as a resource!